Over the Thanksgiving weekend our family was busy with the usual traditions of pumpkin racing, ATV rides and a delicious dinner. No Thanksgiving dinner is complete without dessert and this year we were treated to a delicious apple crisp. The organic apples that we pick ourselves from Avalon Orchards are perfect for this dessert. Preheat oven to 350º F. Peel, core and slice the apples. You can leave the apples plain or sprinkle them with a little bit of cinnamon and sugar. In a medium bowl combine brown sugar, vanilla, oats, flour and cinnamon. Use a pastry blender to cut in the cold butter. 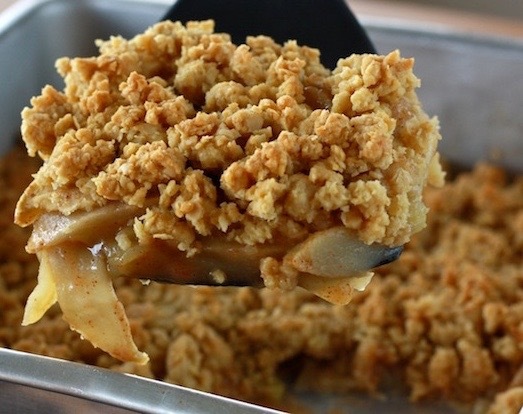 When the mixture looks nice and crumbly you can pour it on top of the apples. Bake for 30-35 minutes or until topping is browned and apples are soft.